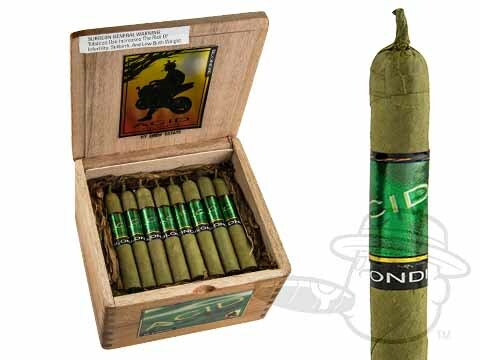 The Acid Blondie Candela wraps a gorgeous green Candela leaf over the one-of-a-kind aromatic infused tobaccos you know and love, creating a bold new profile for the Acid portfolio. Grab yourself a box of the radically delicious and satisfyingly sweet Acid Blondie Candela today! Mistakenly ordered a box of green labeled Candela Blondies, tried one and returned them the next day. The drag was ultra slow and wouldn't stay lit. Best Cigars accepted and exchanged them for my usual box of Blondie Blue labled cigars. This cigar is amazingly mild and smokes really well like all Acid cigars. I will be purchasing them in the future. Acid Blondie Candela is rated 4 out of 5 based on 6 customer ratings. What is the Candela flavor? Hello Richard, Candela refers to the wrap on the cigar. It still has the blondie flavor, but with the added grassy and floral notes that candela wraps bring to the table.